First things first, I must come clean and confess that Idon’t think that these dice are actually ‘Fulhams‘. My gaming partners in crime just wanted to get the name into a blog post, so there it is. Wait. What now? Fulhams? ‘Fulhams’ are dodgy, hooky dice with which the unscrupulous sharps of Roman (and later) London separated the gullible from their cash. Sometimes they might have repeated high or low numbers, and/or they might have been weighted with a little drop of mercury, rigged to throw high or low. Today we’d call them loaded dice. We speculated on what 15th century Fulhamites had been getting up to to have acquired a notorious enough reputation to have dodgy dice named after them. These ones are from the Museum of London website. They’re not completely irrelevant though because this week we bit the bullet and worked on some rather tricky dice. 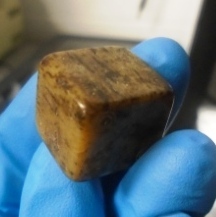 The dice from last time were relatively small and so could be made from one (more or less) solid cube of animal bone. The maximum size possible is determined by the thickness of the wall of the bone. For larger dice is was necessary to piece together several pieces of bone. A (sort of) tube of bone made from a section of long-bone (a leg, say). The solid walls of the bone could be used to create four sides of the die. Then the two ends were plugged up using little pieces of bone to create the last two sides of the die, like this. This kind of die was made in several pieces, and has a cavity inside, a feature of which those naughty shysters could take advantage. Just to confuse matters further, two of our dice had ‘irregular’ numbering. Mine went 1, 2, 3, 3, 5, 6 and John’s had two 2s. Deliberate ploy or Friday afternoon? John thinks it’s hilarious. Hilarious! 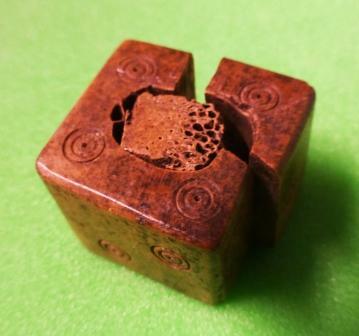 Mind you, John’s dice was a little the worse for wear. But it’s very clear to see the bone structure, particularly in the ‘plug’. I won’t be at the LAARC for the next couple of weeks (Boo 😦 ) because I’m off on pleasure bent again (Yay! 😀 ). Guy! Get some photos of the next couple of week’s plunder. 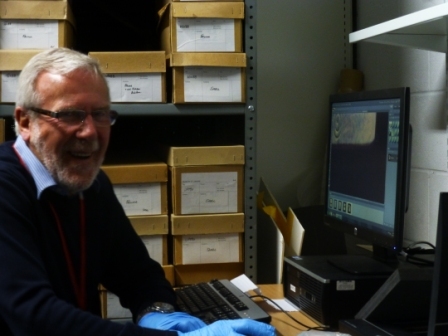 This entry was posted in Archaeology, London, Museums and Exhibitions, Roman Britain, Romans, Uncategorized, Volunteering and tagged Archaeology, LAARC, London, Museum Blogger, Museum of London, River Thames. Bookmark the permalink.